“A Police Action” by AA Freda follows James Coppi, a soldier heading for Vietnam who meets nineteen-year-old Samantha Powers at a local honky-tonk in Colorado Springs. Coppi is a young, brash hustler who cares for nothing besides himself. Samantha, though only nineteen, has been around the block so to speak, and finds herself pregnant with someone else's child. I think the author did an excellent job of portraying both of these characters, though I can say that I didn’t much like the character of Coppi as he was a wheeler and dealer only looking to gain monetary profits from those who had none. I also found Samantha to be weak, a whiner and desperate to find a man. Freda did a great job making me feel so strongly about the characters and with his experience being in the war, his ability to describe the varied personalities of soldiers was superb, right down to those NCO’s who put their soldiers in harm’s way without being in attendance. 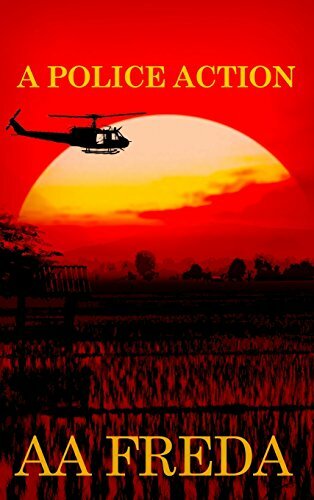 One will feel like they are right in the midst of the jungles of Vietnam and will relate to many of the secondary characters in the book with their down to earth thoughts and feelings. I do think that Coppi would not have gotten away with all his AWOLs and insubordination of senior officers in the real military, but then I have never been in a life or death situation such as war. Having had many friends go to war during the era of Vietnam, I can honestly say that many jumped into marriage, so they had someone to write to, someone to come home to, and because they were scared. Readers will see the author’s true to life descriptions and the inner growth and maturity of Coppi and Samantha. “A Police Action” by AA Freda is easy to read, has relatable characters and provides a good personal approach to how military personnel survived the war. For those who like romance, gritty characters and action, this is a story I would recommend.